Not wanting to sound like a phone aficionada, but I’ve had a lot of telephones in my day. And you can tell a lot about the age of a person from their phone, and their phone number. I remember beige boxy phones that were rotary (of course) and our number was MO6-5555. The MO6 part is correct. The other numbers are to protect the identity of the many people who have had that number since we have. MO meant Mount Kisco. That was our number from 1959-1975. At some point the MO was dropped by the phone company, I guess, and changed to the numbers represented by the letters. So the local exchange for Mount Kisco became 666. Yup. 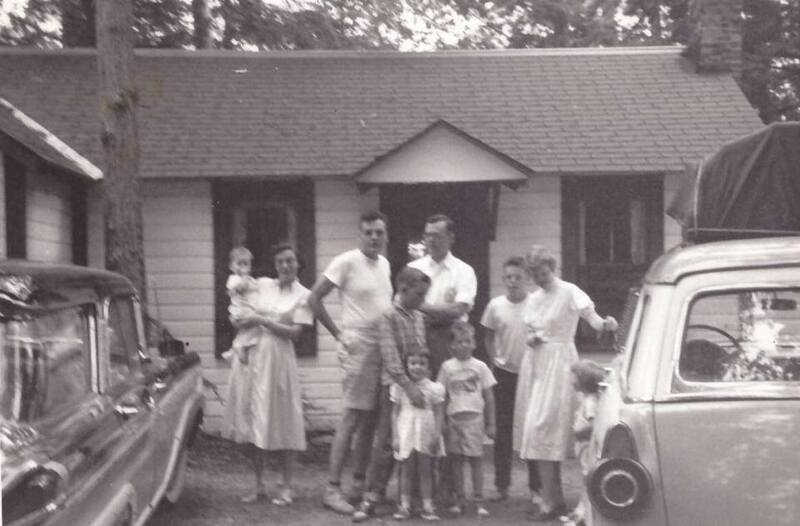 The best phone experience was at the cabin on Lake Dunmore, VT that my grandparents owned. There was a party line for that cabin. And for millenials (I’m only teasing you a little), that does not mean call to find out where the best party was. Everyone attached to the party line had a specific code. You’d hear the ring and not only know when it was for you, but my grandmother knew who all the codes belonged to. I think we were two long rings and one short. Then we knew to answer it. But if, for example, it was two short rings, my grandmother would hold her finger to her lips and we’d be quiet while she carefully picked up the receiver and listened in. How cool is that. All I wanted out of life was a Princess phone. Sleek and stylish and rotary. Then came push button. O.M.G. Side note: The first electronic push-button phone system was sold commercially by Bell Telephone on November 18. 1963 in Pittsburgh,PA. Four days before President Kennedy was assassinated. Placing those two dates and events next to each other makes a strange historical context to me. People had push-button phones, but no one threw out their perfectly usable rotaries right away. Jumping ahead for a moment, I’ve had the 1980’s green kitchen ( thousands of readers over 30 are saying ahhhhh yes…….) with a matching green push-button phone. I’ve had lemon yellow table phones that were rotary. Then, blackberry, droids, iPhones galore. But my favorite phone by far? 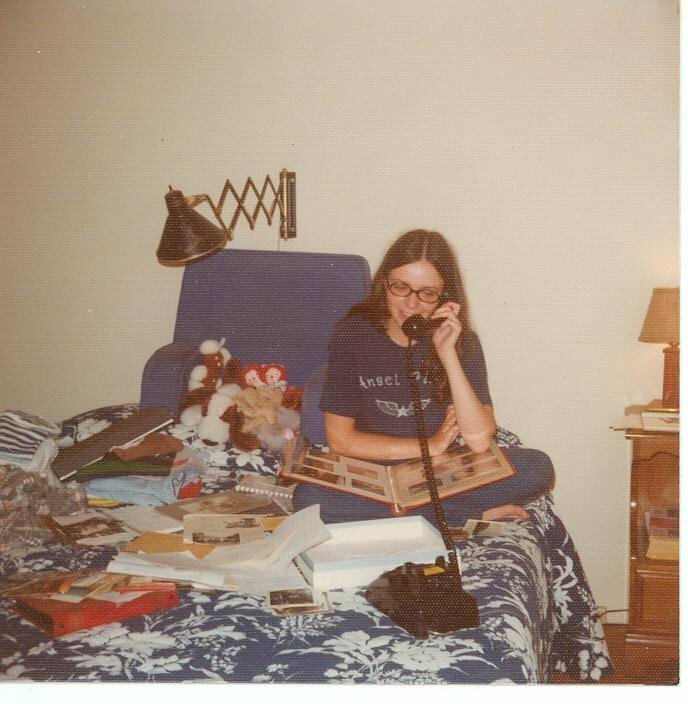 Wait for it………the black rotary phone that came with my first apartment in 1975. I loved that phone. I would sit on my bed and talk for hours. The downside was you had to sit within something like 3 feet of the table for the cord to reach. I loved that it was like lifting weights, it weighed so much. I loved that the mouthpiece came all the way around so you were actually talking into it, not like today where the mouthpiece of my iPhone is somewhere on my cheek. Making scrapbooks while talking on the best phone ever. This entry was posted in Uncategorized and tagged black phones, iPhones, Lake Dunmore VT, Ma Bell, millenials, Mount Kisco, nostalgia, party-lines, phones, Princess phones, push-button, rotary phones, smartphones, telephones. Bookmark the permalink. So interesting that you mention vintage phones. My wife and I were just talking about the need to upgrade ours. My iPhone is already a year old. A year! Phones used to be the way we stayed connected. You remind me so vividly that these clunky relics became tangible pieces of our past, able to conjure up memories and moments. Somewhere along the way, phones became Smart, a tool that was somehow expendable and indispensable at the same time. Thanks for sharing yet another great post Barb! My daughter has been bugging me to write this for a while. She loves the photo of me with the black phone. She didn’t know about the party line, though. Yes, not long ago, I found a black wall phone at Staples and bought it. It didn’t text, it didn’t have Internet, it didn’t have apps or Skype, it didn’t even have memory. All it could do was call and receive calls with only one ring tone. Best of all, it was fastened to the wall and couldn’t get lost. I loved that phone. We don’t have a land line anymore. Probably where you live too, but we got it because it gave us a better package deal with the cable company. We found we never used it, and only received robo calls on it. All of our friends and family have our cellphones. Bad part? If there were ever an emergency, land lines are hooked up directly to the 911 center. I don’t really use the landline either. It is part of a package plan. I hadn’t thought of the 911 hook up. Good point. I wish I could have taken it with me when I moved. And my ex-husband worked for the phone company so he could fix any phones. And taught me a trick or two when the problem was minor. We live in a disposable world now. Every POTS (plain old telephone system) phone can with the most useful feature known to mankind, whenever a telemarketer called, you could slam the headset down on the receiver with all the force of a meteor striking the earth… BAAM! and it never hurt the phone…. Ahhh… the old days of good ole, Ma Bell. I forgot about that! Now I remember an old boyfriend saying something I didn’t like (probably “I don’t love you anymore”) and SLAM SLAM. Good frustration relief. Totally forgot about that. I always wanted a blue princess phone, but it wasn’t meant to be….. My favorite is still the old rotary phones, because they were actually fun to dial! True…I remember having to start over more than once when dialing! Whenever possible, I use the home phone and not the smartphone. Sound is clearer when not vibing through one’s cheek 🙂 And I hung in there till just a few years ago with a real landline, meaning a cord: I had a special super long extension cord with which I could move – while talking – to all the rooms in my little apartment haha! If we don’t hear from you for a while I’ll send the rescue team to untangle you. I had a phone like that. What I loved most about it, was that I could leave it at home. Haha. You couldn’t even take it out of the room! We had a “party line.” Who came up with that name at ATT marketing? Shoulda been the “No privacy line.” We shared telephone access with a heavily accented Hungarian widow on the next block over. It was definitely a learned skill to be able to pick up the handset without being detected by the “party” on the other end. Wasn’t much fun for pre-adolescent me since I couldn’t understand much of what she was saying anyways. I think my asthma induced heavy breathing may have disturbed her, however. What an awesome story. And a great point about the marketing. They should have called them eavesdropping lines.